The cocktail ‘Bloody Mary’ has become synonymous with the morning after the night before and appears on brunch menus everywhere. Today I’m sharing a festive twist on this classic cocktail perfect for enjoying over the Christmas period. Tomato juice in a Bloody Mary is pretty much a given. As is the stick of celery used to give it all a stir. What’s not quite as obvious is the booze. While vodka is the most common I’ve also seen bloody Mary’s made with gin! After we visited Mac and Wild back in the autumn, we also discovered that whisky worked pretty damn well too. 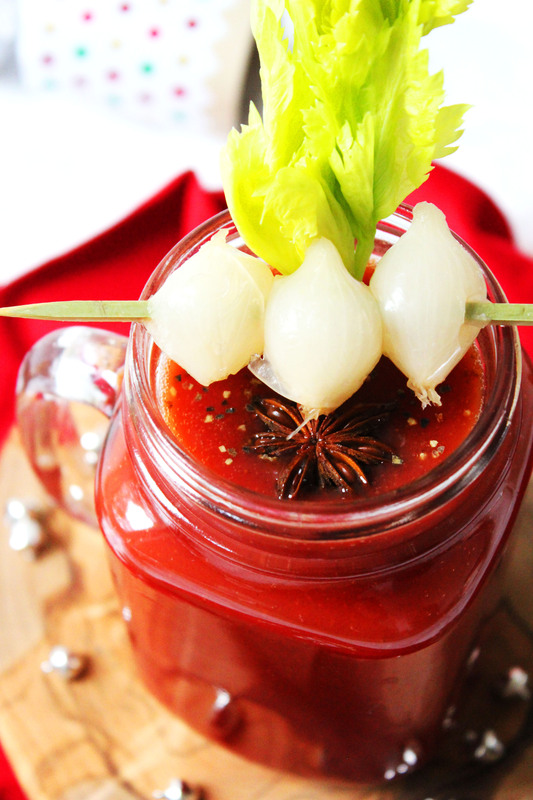 The smoky aroma of a good peaty whisky seemed to me the obvious tipple for including in my Festive Bloody Mary. Something like Jura Superstition, Talisker or even a Laphroaig would work well. It’s also not uncommon for a Bloody Mary to be spiked with port. I’m sure plenty of you will have this in your drinks cupboard around Christmas but for me there was a more obvious choice – sherry! Whisky and sherry actually go remarkably well together. With it’s taste of raisins, the sherry adds a sweetness to the otherwise harsh, bitterness of the whisky making for a more pleasant drink. As well as the whisky and sherry you’ll want to add a few festive spices. Cinnamon, star anise and cloves all work well. A stick of cinnamon also makes a fun garnish (see below!) This recipe also calls for the usual Worcestershire sauce, tabasco for heat and cracked black pepper for a savoury note. Now we’ve got the tomato juice, booze and spices there’s only one last thing to discuss – the garnish. A big leafy stick of celery is always popular. As the hangover subsides and hunger kicks in it does provide a useful snack. Perhaps a little more Christmasy (this is a Festive Bloody Mary after all) is my favourite garnish, the pickled pearl onion! 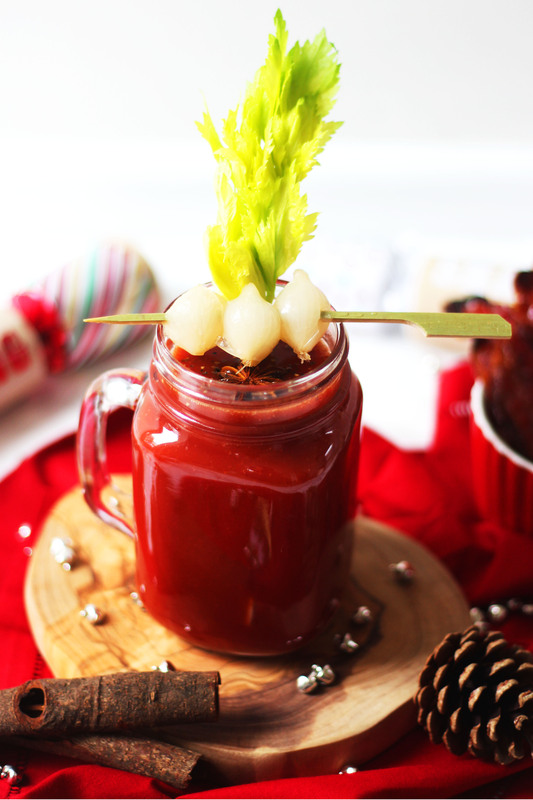 Christmas wouldn’t be Christmas without a big jar of pickled onions and a baby pickled onion on a cocktail stick is the perfect way to finish off this Festive Bloody Mary! Pour all the ingredients into a shaker with ice and roll it gently for six seconds. Strain into the glass over ice. Garnish with pickled pearl onions and a celery salt rim if preferred. You don’t want to forget this recipe, make sure you’ve pinned so its easy to find the morning after the night before. All that’s left to do now is to say Merry Christmas and a Happy New Year! I look forward to seeing you all in 2017.